Written by a soldier at Keesler Field, Mississippi, during WWII, in May, 1942. He was training at the Air Corps Technical School. From the letter……. 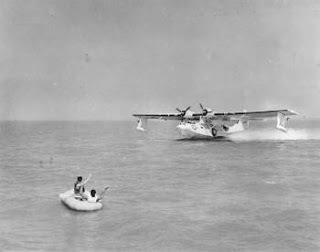 Consolidated OA-10A Catalina (USAAF designation of the PBY) landing off Keesler Field , Mississippi, a training exercise with Marine Corps rescue boat crews in 1944.